This is the 2nd interview in new series of podcasts on writers, their birth charts, and their books. Jaimini Vedic techniques show clear writing yogas and various other indications of writing in the birth chart, as well as the kind of writing, or most likely genre, an author will write in. The Moon is always involved in writing as it rules rhythm and the mind. The different types of writing depend on the planet that aspects or rules the Moon. Venus and Moon combinations are known for producing writers of science fantasy/dark gothic, science fiction, poetry, prose, and certain types of non-fiction writing such as books on astrology. Jupiter and Moon combinations typically produce writers that are the helpers and wisdom teachers of the world, such as astrologers, coaches, therapists, scientists, and teachers. I’m interviewing Ryan Kurzcak, of Asheville Vedic Astrology, about his new book in this podcast. The writing yogas involved in Ryan’s birth horoscope is Venus ruled by the Moon and it’s with the Sun, his soul planet (the Atmakaraka). He also has Venus and Jupiter ruled by the Moon in his Navamsa chart! This means that writing is a career path for him. Either writing by itself, or writing as part of his work as a Vedic astrologer and teacher. He is very prolific and he has published three books prior to this new one, making it a total of four books now. Scroll down the page to Books by Ryan Kurzcak to see his other books. 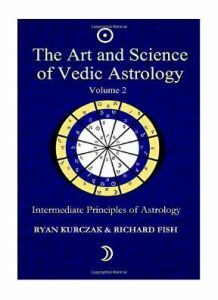 The Art and Science of Vedic Astrology Volume 2 builds upon the previous work and takes us deeper into the heart of Jyotish. This books is based on an advanced tutorial course and is systematically arranged to expand upon the important variables necessary in horoscope analysis. the subtler aspects of astrology are brought to light, enabling the astute student of Vedic Astrology to enlarge comprehension and predictive abilities. Many potent, yet often neglected principles are explained in detail, such as the Lajjitaadi Avashtas. A comprehensive delineation of planetary Karakas and the house lord combinations are included to help guide the practicing astrologer towards accurate assessment of one’s karmic state. The House Lord Combinations chapter is very absorbing reading and the most accurate one I’ve read when it comes to my personal birth chart and life and the lives of the people close to me. I enjoy having the book open to this chapter on my desk just so I can read it for fun. It’s a fantastic meditation device as well as a helpful guide when delineating a chart. Plus, the Avastas, Varga charts, and the Appendix pages make this my first go-to reference manual when I’m working on a birth chart! We talk about his personal writing process, his writing yogas, what he is writing now, and what he wants to write in the future. On this newest book, we talk about sections in the book in some depth. He explains how to use the book, who the book is for, and who the book is not for. He tells us more about his beloved teacher, Richard Fish, and why he and Richard collaborated on the book, and more. Are you at a loss on how to begin to read a birth chart? Do you wish you had an easy-to-use reference manual of the best astrological techniques at your fingertips? Do you want to save time and stay focused when delineating a chart? Are you curious about some of the more advanced astrological techniques that other astrologers talk about? Do you want to feel more confident in giving readings? What are the Benefits of Having the Art and Science of Vedic Astrology Volume II on your desk? If you are not sure where to begin a reading when working with a client or even just doing a casual reading for a friend, this book has an in-depth PROCEDURAL reference page to get you started. It is thorough and in- depth if you want to give the your best readings ever. Sometimes you just can’t imagine what the meaning is of a planet in a house as the lord of another house. You’re drawing a blank, or you are new to Vedic astrology, or you are not sure of the house meanings (there ARE a lot of different opinions out there on the subject). If you are a western astrologer and are curious about Vedic astrology techniques, but you don’t want to buy Vedic software just yet, or you want to teach it to other western astrologers who don’t have Vedic astrology software. The planets have friends and enemies just like we do and the planetary relationships are the most accurate way to determine a person’s psychological makeup. If a man has Saturn with the Sun, for instance, you know he is going to have a problem with lack of confidence and he won’t listen to advice from his loved ones, even if his way of doing things doesn’t work. Knowing this, you have a way to advise your client if they are married to man like this, or if he has come to you on his own (if he does, this is a very good sign that the astrology will be helpful to him). Vedic astrology is well-known for it’s divisional charts called the Varga charts. The Varga charts are used to fine tune the birth chart by giving a close-up view of the affairs of that house. The most famous of the Varga charts is the 9th divisional chart called the Navamsa. When you can’t remember all the significations of the Navamsa or any other Varga chart, just go to pages 52 through 76 to read about the significations of each V arga chart. When you want to pinpoint the best time to do something specific down to the hour. This was used in the olden days for gather herbs to make medicines and for administering the medicines for the best effect. We can still use the planetary hours today in many helpful ways such as structuring your day according to the planets, or starting and stopping a project, and more. Ryan’s book has a handy Planetary Hours Reference Table on page 15. These are also known as Upa-grahas and are unique to Vedic Astrology. There are times when the use of these invisible sub-planets is the only thing that can explain difficulties in a person’s life. Ryan shows you how to find these special “planets” in the chart without software, and then gives some guidelines for further research. The birth chart is basically a picture of our karma, and understanding the Classifications of Karmas and the Degrees of Karmic Strength in this context equips you to give the best possible advice to your clients and for your own self-growth and understanding. Bhava Charts – an intelligent discussion of the various house systems, the indications of the houses, the special technique of Sudarshana Chakra (this is something that is practiced in western astrology, but with a slightly different perspective), and finally, Special Ascendants.